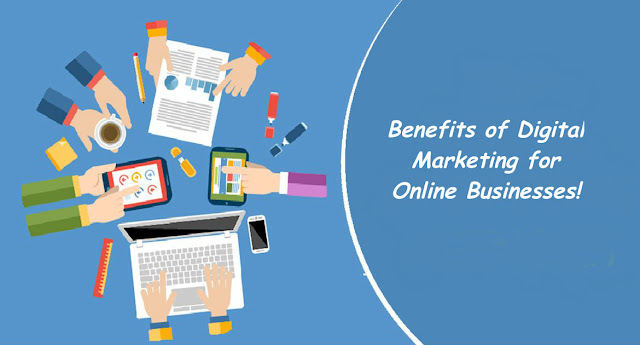 Home SEO 5 Benefits of Digital Marketing for Online Businesses! 5 Benefits of Digital Marketing for Online Businesses! In today's digital world, the marketing industry is fast transiting from traditional marketing platforms like TV ads, magazines, billboards etc. to digital platforms including PPC, SEO, email marketing etc. The reasons behind this massive transition to digital marketing platforms include better ROIs, larger reach, and tangible results. Digital marketing is increasingly offering online businesses a viable and enhanced approach to reach a larger audience with a robust and measurable technique. Below we will be looking at some top gains of digital marketing for online businesses. Perhaps the biggest and more viable benefit of digital marketing is its ability to produce tangible results. Irrespective of the digital marketing medium you choose, the platform offers detailed and precise insights into the effectiveness of the campaign with tangible results. Access to these insights helps businesses in real-time monitoring of their campaign, which facilitates them to make any necessary adjustment to the campaign given the platform isn't yielding adequate results. It also helps digital marketing agencies to produce verifiable and tangible marketing reports for clients, thus increasing in their business recognition and expertise. Customers today are looking for ever more personalized and customized content that suits their needs and requirements. The abundance of choices has made choosy in their picking for online businesses to a point where they aren't ready to make a purchase without thorough research and detail analysis. The digital marketing offers businesses a great platform to create and produce highly customizable and bespoke marketing campaigns that are in-line with customers' choices and preferences. The availability of shopping trends and real-time analytics help marketers to create a strategic marketing campaign, tactically designed for a particular target audience. Thus giving businesses a competitive advantage over competitors. Traditional marketing campaigns including TV and magazines ads come at high costs, which restrict small businesses and startups to launch a campaign. Contrarily, digital marketing campaigns come with a significantly lower price tag. In fact, apart from paid marketing, most of the other aspects of digital marketing needs including content creation, backlinking and videos can be created without any cost, provided businesses have the expertise required to produce the material for the campaign. Yet another massive benefit of digital marketing services over traditional marketing platforms is the ability to reach the target audience. Traditional marketing campaigns rely on mass campaigns thrown out without any regards to the targeted customer base. Digital marketing provides an excellent platform for businesses to identify and market their services/products to the target audience, revealing better ROIs and increased sales. One of the biggest problems faced with traditional marketing platforms is the lower conversion rates for the campaigns. Digital marketing campaign with its customized campaign, powerful data insights, and target marketing capability enable businesses to get better ROIs with higher conversion optimization rates. Taimoor Khan is an avid digital-marketer and a passionate blogger. He likes to share his thoughts on latest from the digital world especially e-commerce industry. He is also part of a New Zealand based company; Starlinks - digital marketing agency Auckland and Christchurch.